Accessories for rotary tools in dental and industrial quality: Diamond-coated Bits, Drills and Discs. For drilling and machining of glass and types of stone including granite. Recommended for use on drill presses with a speed of 2,000rpm with a speed of 2,000rpm with the use of coolant. Shaft Ø 2.35mm (3/32"). With natural diamond dust for cleaning out holes in pearls, coral, turquoise and other precious stones. Shanks Ø 2.35mm (3/32"). Shape, grind, finish and engrave with precision! These high-quality, long lasting diamond burs offer the hardness of an even diamond coating over stainless steel to provide uniform cutting on a variety of materials such as glass, ceramics, porcelain, stones, non-ferrous metals, steel (even chrome-cobalt alloy), etc. All shanks Ø 2.35mm (3/32"). For cutting, grinding and deburring. Same application as described below. Less heating up due to cooling holes. No burn marks! Shaft Ø 2.35mm (3/32"). For cutting very hard and brittle materials. 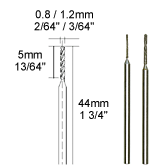 Only 0.6mm (3/128") thick, wheel Ø 20mm (13/16") or 38mm (1 1/2"), shank of mandrel: Ø 2.35mm (3/32").